Magnets are commonly made of iron, or sometimes a mixture of other metals. Cobalt and nickel are also magnetic, but iron is the most commonly used metal for magnets. 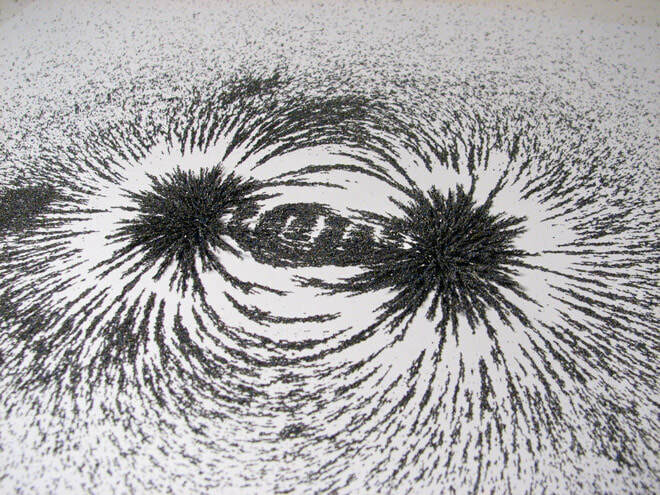 If you could draw a magnetic field on a bar magnet, you would see lines moving out from the North pole, curving around and returning to the South pole, just like our experiment with the iron filings. The magnetic field is strongest inside the magnetic material. Around the magnet, the strongest fields are around the poles. As you get further and further away from the magnet, the power diminishes until it is no longer perceptible. Have you ever heard that opposites attract? This concept came from magnets. While it is not true for human beings, it does work for magnetic attraction laws. 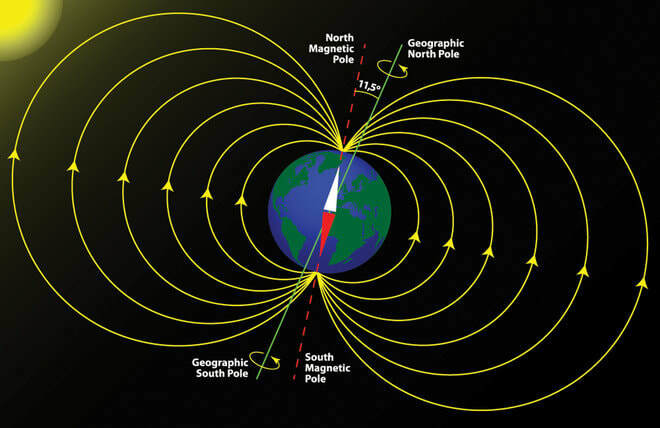 A magnetic North pole will attract the South pole of another magnet and repel a North pole. The Earth also has a magnetic field with two poles. The reason for this is, the Earth has a solid inner core, two thirds of the size of the moon, composed mainly of iron! At 5,700 degrees Celsius, this core ball of iron is as hot as the surface of the Sun. However, due to the pressure caused by gravity, it does not become liquid. Surrounding this inner core, there is a 2,000 Km thick layer of iron, nickel and other metals. There is less pressure here than in the core, so that means this layer is fluid. The flow of this liquid generates electric currents, which in turn produces magnetic fields. The Sun produces a stream of energized particles, called solar wind, which bathes the Earth all the time. Thankfully, the Earth's magnetic field extends far out into space and shields our atmosphere from the solar wind. The interactions between Earth's magnetic field and charged particles coming from the Sun are often referred to as "space weather" and cause phenomena such as the aurora borealis or Northern Lights. It also causes satellite failures and radio transmission problems. The needle of a compass is really a tiny magnet with a pointer. It is suspended in liquid, just like the Earth's core. It is affected by the Earth's magnetic field and aligns with it (North to South). The red side of the needle always points to the Earth's magnetic North pole. The first navigation compasses were just pieces of lodestone tied to a piece of wood, floating in the water. The lodestone would align with the Earth's magnetic field. You can think of the Earth as having a giant bar magnet buried deep within. When we put a magnet near the compass, it overrides the Earth's pull because the magnet has a stronger magnetic field than the Earth's core, so the compass needle aligns with the magnet. So, we saw that magnetism is related to the Earth and involves attraction and repulsion of materials. But we also saw through our experiments that magnetism is related to electricity. When a circuit is closed, the electrons in the wire move through the closed loop; this movement creates an electrical current. The movement of electrons through the metal produces a magnetic field around the wire similar to how the Earth's magnetic field is created by the movement of liquid metal. If you place a compass near a wire carrying an electrical current, the needle will move, possibly aligning it with the magnetic field lines! To blow your mind, please watch video below.